The Collaborating for a Cause project aims to do exactly what it’s name says – Eliasson and Rimowa have come together to create a series of luggage stickers, with all proceeds going towards helping the Little Sun Foundation deliver solar energy to the most vulnerable communities around the world. Founded by Eliasson, the Little Sun Foundation is a non-profit organisation that works to bring high-quality, durable and long-lasting solar products to people who would otherwise not have access to clean energy – according to the World Bank this is around 1.1 billion people. Titled A Collection of Stone, Lava, Meteorite, Ice, Driftwood, and Lichen, the sticker collection draws on Eliasson’s colourful artistic language, and takes the form of various organic shapes, meteors and stones as well as ecological terms and words including “anthropocene” and “ecosystem”. “Art helps us identify with one another and expands the notion of ‘we’ from the local to the global. Our actions have consequences for the world,” said Eliasson. “Little Sun is a wedge that opens up the urgent discussion about bringing sustainable energy to all from the perspective of art in order to raise awareness about the unequal distribution of energy today,” he added. 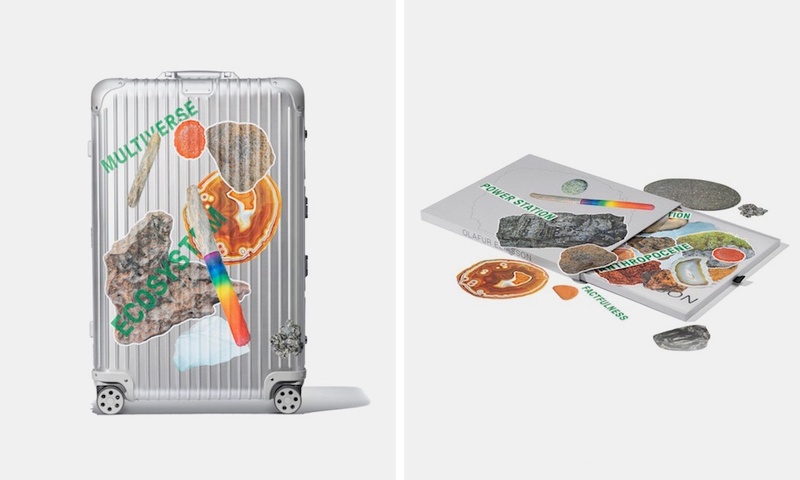 With designs ranging from extra small to extra large, the 46-piece sticker collection is a first for the luggage brand, which is known for its classic boxy suitcases made of aluminium. “As big admirers of Olafur’s work and his commitment to sustainability and the environment, we’re happy to create something together that reflects these ideals at the core of both of our creative processes,” said Alexandre Arnault, CEO of Rimowa. “Rimowa is already known for its commitment to timeless craftsmanship and quality; it is our hope we continue building not just for the now, but with careful consideration of the future, as well,” he added. The limited edition collection will be available to buy from 3 December 2018 from select Rimowa stores and online, but will have to be snapped up quick as only 500 have been produced. Each set of stickers is numbered and packaged “thoughtfully” in an eco-friendly box designed in keeping with the artist’s concept. The Icelandic artist gained a lot of recognition back in March 2017 for his set design for Wayne McGregor’s Tree of Codes ballet, where he used a combination of mirrors and coloured screens to create different abstract scenes. Image : the stickers set is available for sale on Rimowa.com for £240/€250.